Your TASER® X26 weapon will look and work "like new" when you receive it as our inventory arrives in working condition and is then updated with the latest version software and thoroughly tested for reliability in the field with one full year warranty against manufacturer defects. You will be very pleased with the condition of all our products. The X26 law enforcement model TASER® X26 fires from a safe distance of 15 feet away (or 21 or 25 feet for law enforcement) with ultimate take-down power as it overrides the central nervous system of the human body affecting both sensory and motor systems. Proven Electro Muscular Disruption (EMD) and Neuromuscular Incapacitation (NMI) is exclusive with TASER®. The law enforcement X26 is also known as the X26E (for Enforcement). The proven TASER® X26 law enforcement model is still preferred by many as the most compact, powerful and reliable. 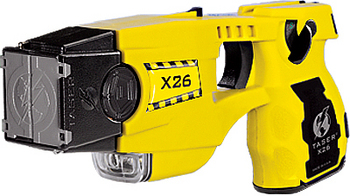 TASER Color: The TASER X26 is available in Black, Yellow and Clear (when available). You may specify your color choice in the "Special Instructions" section that appears after entering your credit card number. If you do not specify, we will ship Yellow. Same Day Shipping - when DOB, Last 4 of SS# and Drivers License# is provided in "Special Instructions", and the order is placed before 3:00 PM Eastern Time or 12 Noon Pacific on a business day. LE Officers can instead type in their Agency Name and Badge Number. Security Officers can instead type in their Guard Card Number. Every attempt will be made to ensure same day shipping under those conditions, but it is not guaranteed. Please call to confirm the status of any rush order. Your order will be delayed while we attempt to obtain that information if you do not provide this information when you place your order. This information is not required only when shipped to a government law enforcement agency address and you provide a law enforcement ID, badge or shield# in the "Special Instructions". SIGNATURE REQUIRED - If you want to sign for it, you must type "SIGNATURE REQUIRED" into the "Special Instructions" window. Otherwise we will ship it with no signature required. You are responsible for lost or stolen merchadise. There is no extra charge for signature verification delivery service. If there is any doubt that your package will be safe where your mail carrier delivers it, request a signature. Free Service Holster - when ordered at the same time upon request in "Special Instructions". Request a Left Hand or Right Hand Holster. If you do not specify, we will ship a Right Hand holster. All Service Holsters are quality duty holsters that can be configured for either conventional or cross-draw use. You may request a first and second choice for Blade-Tech™, Blackhawk™ or Safariland™ Duty Holster. Complete the Payment Method section, click "Continue" and the "Special Instructions" will appear. Type in your request. Law Enforcement Agencies and Officers: We sell to law enforcement agencies and officers in all 50 states throughout the USA. Identify yourself by typing your agency name and badge, shield or ID number into the "Special Instructions" window. You may also type in your first and second choice requests. You might request a "Right hand Safariland™ Duty Holster First Choice, Right Hand Blackhawk!™ SERPA Holster Second Choice, and Green 25' Law Enforcement Cartridge" for example, by typing that into the Special Instructions window. Civilian Restrictions: Civilians may now own and use TASER weapons in 47 states. Only HI, NY, and RI still ban the civilian sale of TASER weapons. We sell and ship to law enforcement agencies and government law enforcement officers in all 50 states. Illinois requires a FOID card and Washington DC requires a license. If you have any questions regarding your ability to carry a TASER weapon in your state or municipality, view the detailed TASER legal requirements page at TASER.com for additional information. We require your Drivers License Number, Date of Birth and the Last Four Digits of Your Social Security Number for the purpose of an Anti-Felon background check. We do not sell or ship to Canada or anywhere else outside the 50 United States. Call 702-617-3300 for more information, for overnight next day shipping, or to order by phone. The "Special Instructions" Window - Type in your ID and special requests into the Special Instructions window. The Special Instructions Window appears in the "Review and Submit Order:" section when you Continue past the "Payment Method:" section. So you have to put in your credit card first and then click "Continue" before you can see the Special Instructions Window. Checks - Choose "Payment by Mail" under as the Payment Method. Click "Continue" and type into the "Special Instructions" window that you are mailing a check. Make checks payable to and mail to: Accredited Security, 6017 Pine Ridge Rd Ste 73, Naples FL 34119. Please include the Order Number on your check. Government checks will allow us to ship upon receipt. Allow up to three weeks for company and personal checks to clear. Call 702-617-3300 if you have questions. Law enforcement and civilian identification information is collected as specified by the manufacturer's anti-felon policy prior to the time of shipping to lessen the likelihood that any of our products will be used unlawfully. Your TASER X26 will be registered to you and activated when you receive it. TASER® is a Trademark of the Manufacturer TASER International, Inc. Accredited Security does not offer a warranty on TASER CEWs through TASER International, Inc., nor is warranty on a purchased and refurbished TASER CEW offered or honored by TASER International, Inc. Accredited Security is not affiliated with the manufacturer Axon, formerly known as TASER International, Inc.